Abelia x grandiflora is known as the Glossy Abelia and is generally used as an ornamental shrub Abelia have a bushy habit and can also be used as a hedging plant. This is actually a hybrid deciduous shrub. 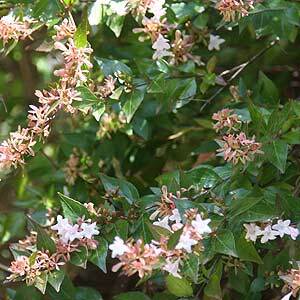 Abelia have a bushy arching habit, small glossy leaves and white to pink flower. A few named cultivars such as ‘Kaleidoscope’ a relatively new release. Abelia grandiflora – Can reach around 3m in height, glossy green foliage with pink flowers. Excellent hedging plant and easily pruned. Abelia grandiflora ‘Nana’ – Low growing more compact than the species, reaches around 1m in height with a similar spread. Glossy green foliage with pink to mauve flowers. Abelia ‘Francic Mason’ – Sometimes called the ‘Golden Abelia’, golden green foliage that tends to bronze during cold weather. Reaches around 2m in height. Abelia grandiflora aurea – Golden green foliahe. Abelia x grandiflora Kaleidoscope – Variegated foliage that changes through the seasons. Compact variety to around 1m in height. Abelia require little pruning and dwarf species are suitable for hedges or garden borders. Mulch to retain moisture. Abelia prefer full sun or semi shade, a well mulched soil. Abelia can be used as a hedging plant or as a specimen. Birds like Abelia and it is sometimes used for bonsai. Generally available in tubestock to 200mm pots Abelia is a useful plant for mass planting in commercial borders, maintenance is easy and plants are generally long lived.